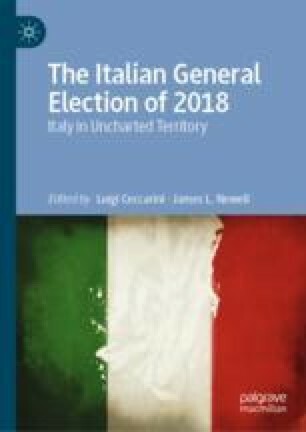 Even though a large number of critics and commentators described the Italian 2018 election campaign as ‘ugly’, the competition between the political forces allowed the political class or, at least a specific part of it, to ‘tune in’ to the will and demands of the electorate. In this respect, even more than other campaigns of the past, the 2018 election campaign served as an important and effective tool, especially in linking the opinions of voters with the elected, particularly in the socio-economic and immigration fields. Moreover, unlike previous election campaigns, the 2018 campaign continued well beyond election day, to include the subsequent period of negotiation between parties and the formation of the government. For this reason, this chapter does not analyse a single election campaign; instead it focuses on the various phases of a lengthy campaign that took place before and after the vote. Mentana, E. 2018. Questa è la più brutta campagna elettorale. L’Aria che tira, March 2. http://www.la7.it/laria-che-tira/video/enrico-mentana-questa-è-la-più-brutta-campagna-elettorale-02-03-2018-235486. Valbruzzi, M. 2018a. Analisi della campagna elettorale. Istituto Cattaneo. https://www.cattaneo.org/2018/02/28/analisi-della-campagna-elettorale/. Valbruzzi, M. 2018b. Che programmi avete per le elezioni? Istituto Cattaneo. https://www.cattaneo.org/2018/02/06/che-programmi-avete-per-le-elezioni/. Valbruzzi, M. 2018c. Chi ha vinto la partita del governo? Istituto Cattaneo. https://www.cattaneo.org/2018/05/23/chi-ha-vinto-la-partita-del-governo/.